Liane and Michael wanted their ‘Jewmanist’ wedding to be a celebration of their life together and, whilst it was important that it was very much a non-religious occasion, they were still very keen to reflect elements of Liane’s Jewish heritage which, culturally, is a big part of her life. 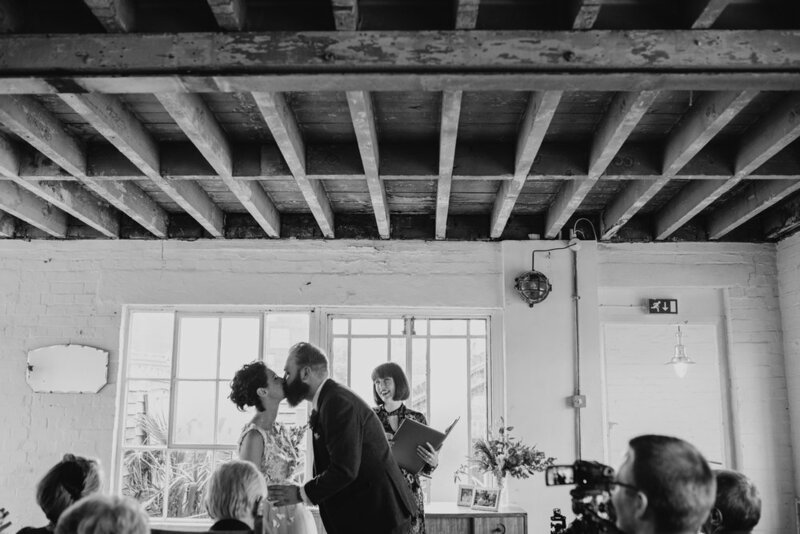 Michael and Liane’s humanist wedding took place on a sunny October afternoon at One Friendly Place, in Deptford. With autumn light pouring through the window, we kicked off the wedding ceremony with our twist on ‘The Seven Blessings’, which are traditionally shared at Jewish wedding ceremonies. Liane and Michael chose the seven elements that they see as essential to the future success of their marriage - Commitment, Family, Equality, Adventure, Patience, Humour, Wisdom - and matched them to seven special people who represent different areas of their lives. Each of them wrote a ‘blessing’, based on their allocated theme, to surprise Liane and Michael with on the day. ‘Neither Michael nor Liane buy into the notion of soulmates. They find it hard to believe that each of us has but ONE person out there… waiting for us to just stumble upon them. It just doesn’t seem very… scientific! Liane has another – perhaps more measured - way of looking at love: That ‘The One’ doesn’t exist because soulmates are created together over time. Rather, in looking for love, we should all be seeking… Someone who lights a spark. Liane and Michael smashing the glass! Image by Lex Fleming. Michael and Liane were keen to write their own vows and, again, these were a surprise to each other on the day, which meant lots of crying from all of us in the room! This line from Liane got me really choked up… ‘I promise to forever invade your personal space because I'll never want to stop holding your hand, even when it's impractical. I'll always kiss you hello, goodbye, good morning and good night, even though the dog may get a kiss first.’ Waah! We finished their ceremony with another traditional Jewish wedding ritual, the smashing of the glass, before sending Liane and Michael off with a big group sing-along to one of my all-time favourite wedding songs Can’t Take My Eyes Off You. Accompanied by Liane’s sister on piano, Liane and Michael’s guests belted out the lyrics, with all the requisite arm waving and feet stomping at the relevant points. The energy in the room was absolutely incredible! It still gives me goose bumps to think about it! Liane and Michael were both such interesting, and thoughtful people with so many unusual musings on love, commitment and relationships… so a huge thank you to them for being so open with me and giving me so much to work with! I had an amazing time!